One pot meals are unrivaled when it comes to saving both cooking and clean-up time in the kitchen. At the same time, they offer a complete meal of energizing proteins, revitalizing vegetables and healthy fats all in one happy little dish. For those evenings when you have just enough time to keep it simple, let your minimalist side run wild with all the possibilities of dinners that are ready in 30 minutes or less. You’ll be pleasantly surprised with all that is available, perhaps even leaving you with a few spare moments to cut a slice of homemade Keto bread. It’s been said that there is a certain kind of magic associated with making dinner every night in a single pan; if you are familiar with sheet pan fajitas then you know exactly what we are talking about. Fewer dishes, less washing up, and a short list of ingredients is certainly the way to go. 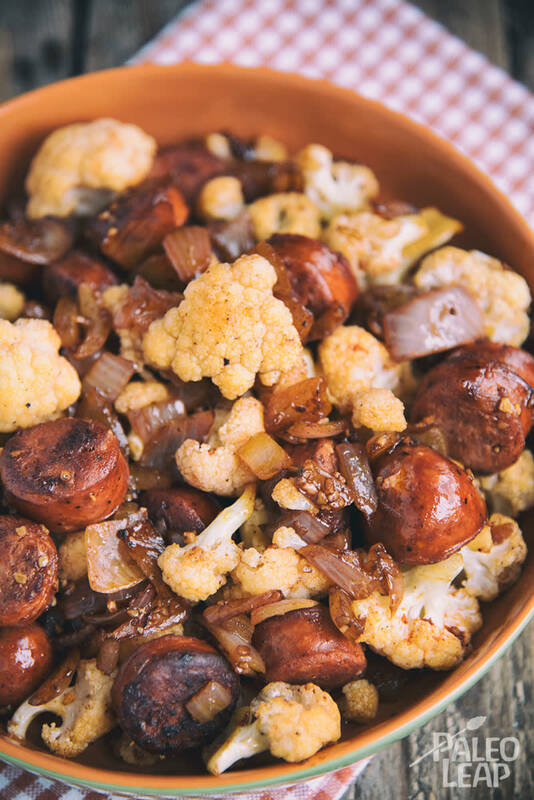 Stir-fries often fall into the category of quick meals, and this sausage and cauliflower recipe is no exception, except this: you don’t have to use spicy sausage if you don’t want to. Explore the world of breakfast sausages, Italian sausages, country sausages, bratwurst, Polish sausage, liver sausage, blood sausage, venison sausage. Choose your favorite Paleo sausage and roll with it. While many people would consider this stir-fry a dinner, we think it suits as a Paleo breakfast too. Add the sliced sausage to the pan and cook until browned, about 4 to 5 minutes. Remove the sausage and add the onion and garlic, cook 2 to 3 minutes. Add the cauliflower, chicken stock, paprika, and season to taste; cook until soft, about 10 to 12 minutes. Bring the sausage back to the pan, stir and adjust seasoning if needed; cook another 2-3 minutes or until sausage is warmed through.